Summer time is a time for cookouts, picnics, and one of my favorite things… pasta salad. Actually, pasta in general is one of my favorite things warm or cold, topped with a vinaigrette, smothered in cheese, or mixed with my famous tomato sauce. It’s one of the perfect foods out there that you can eat year round and every one in the family loves. You know…. now that I think about it I have never met anyone that doesn’t like pasta. I took one my daughter’s favorite things, pesto sauce, and created a summer pasta salad with it. Something light and full of fresh seasonal veggies. But pesto alone wasn’t going to cut it and I knew that it would need something a little more to cut the sharpness of the flavor, especially if I wanted everyone to eat it at dinner. Adding something to the pesto to make it a little creamy was exactly what it needed. 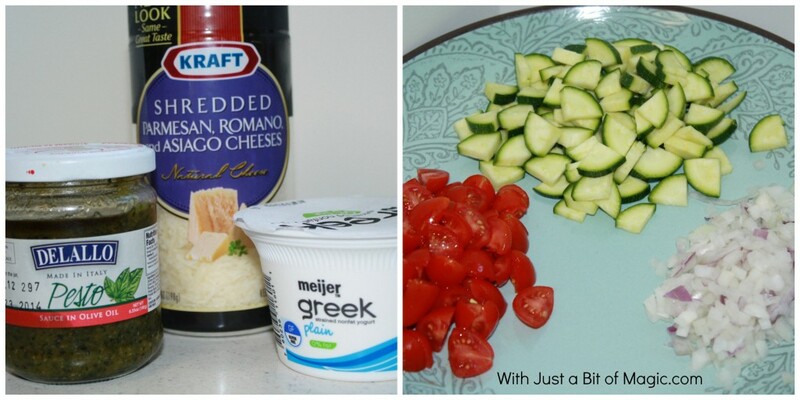 Instead of the typical mayo or salad dressing that tend to end up in pasta salads I used Greek yogurt to help lower the calories, add a zing to it, and of course the creaminess that I was looking for. Cook the pasta according to the instructions on the package. Make sure that salt the water though because this is the only chance that you get to season the pasta and yes, it does make a difference in the taste. In a small box mix the pesto and yogurt together. When the pasta is cooked drain it and run cool water over it for a minute. Pour well drained pasta into a large bowl and gently stir in the pesto dressing. Mix in the veggies carefully so you do break them up. Top with some parmesan cheese when you serve it. The veggies in this can be mixed up, changed, and eliminated all together if you want. 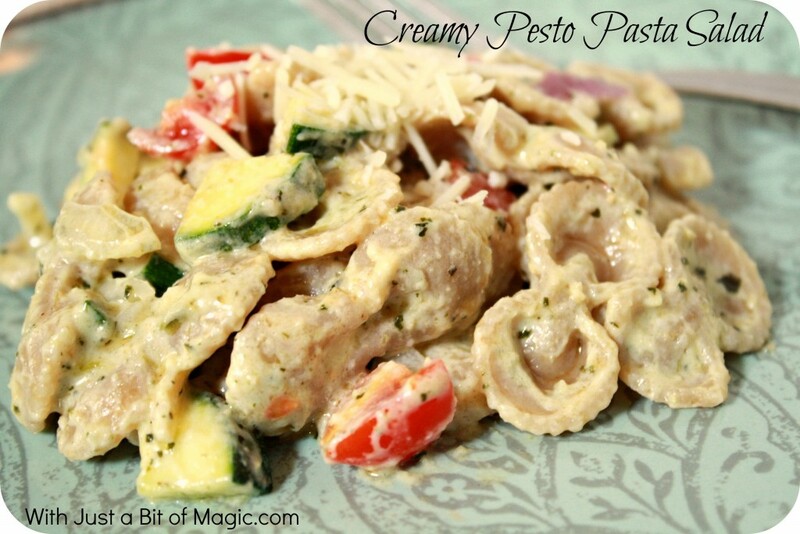 This creamy pesto pasta salad was a hit! My daughter absolutely loved it and I’m sure that it’ll all be gone before I get home from work tomorrow too. Have you tried Hodgson’s Mill pasta yet? It’s delicious! It’s 100% natural, certified non-GMO Whole Wheat pasta and is made with highest grade grain, produced domestically wherever available, and purchased in the United States. Now, for the giveaway part… one lucky winner from the U.S. will get their very own box of assorted Hodgson’s Mill pasta. You will have all the pasta you’ll need to make your own summer pasta salad… or just make my creamy pesto pasta salad. Leave a comment telling me what you’d make if you won. Use the handy tweet button at the top of this post to share this giveaway & recipe. Pin the image of the creamy pesto pasta salad. Fine Print: One winner will be selected (U.S. only) and will have 24 hours to respond to the email I send them. If they do not respond then another winner will be selected. All entries will be verified. The giveaway ends on Friday, August 23th at 11:59pm. Disclosure: I was given an awesome box of Hodgson’s Mill pasta and entered my recipe in their Summer Pastabilities where I compete to win grand prizes like an outdoor grill valued at $1,400 and a brand new iPad. All thoughts, opinions, and recipe are my own.